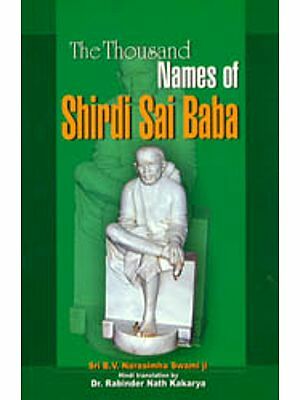 This book is a collection of the saying and teachings of Baba that are highlighted in the experiences of the devotees as they interacted with Him. Thought direct intervention in their lives, and the use of parables, He led them to spiritual growth. Like the caring aren’t that He is, He used love and humors to help His devotees understand profound philosophical and spiritual ideas. These id3eas were expressed in simple language, and often seen in practice in their ordinary day-to-day experiences, so that devotees were unaware that they were acquiring Buddha pathetic. Buddha is instruction, or perception, and pathetic is protocol or steps of a ritual. Vinny Chitluri was born in Aruvankadu (Nigeria), but was educated in ablaut (Madhya Pradesh). She did her postproduction in Pediatrics from Kawaka saran Hospital, Delhi. Then she went to the U. S, passed the board examination and was conferred the ‘Diplomat of the American Academy of Pediatrics’. While in the U. S., she started thinking seriously about her karmic bonds with her family. As her father worshipped Baba, she was also able to do the same from a very young age. She has been worshipping Baba for sixty years. Her relationship with Baba is that of a ‘best friends’ as He loves her no matter what she does. She retired from the medical profession at the age of fifty and came to Shirdi in 1994 and settled there. Then she set about trying to know more about Baba. She soon realized that ‘the more she learned about Him, the more ignorant she was’. Alas, it would take her many lives to know a little about this inscrutable God. But her quest is ongoing. Hari Sitaram Dixit or Kaka Sahib as Baba called him had a wonderful habit of keeping a diary. Many of the other devotees also did the same. Meticulously he wrote Baba’s lee/as as they unfolded before him. Every letter, every note that he received from the devotees he preserved. Most importantly, he wrote Baba’s words and sayings. For they give a great deal of insights into Baba’s moods, like sham rage which in actuality was a blessing in disguise, and Baba’s teachings. Unfortunately, unlike Ganesh Shriknishna Khaparde he has not mentioned the dates. Nonetheless, the diary is a gem and is priceless. The leelas from his diary were published in the Sal Leela Magaine in the early I 920s. Most of the leelas given below are from his diary. I for one thank Kaka Sahib, for enriching the lives of many devotees of Baba by his contribution of ‘The Dixit Diary’. Especially in the parables, Baba flits from one topic to another. The English translation is nearly impossible. Since this book is about Baba’s Vaani, it has been translated verbatim. Therefore, it is impossible for the English translation to do justice to the ‘sayings’. No translation can bring out the nuances of the original, and therefore the reader may find that the language does not flow naturally. Baba when he spoke Marathi or Hindi it was colloquial, so it’s even harder to write it in English. He used words like are, re and kyako, just to mention a few. This book is a kaleidoscope of Baba’s lee/as, some parables, his sayings and his bodhapaddhati. Baba had an unique way of teaching, by way of dakshina, parables and even directly. This book is Baba’s, but the imperfections are definitely mine. Baba gave me many gifts in my life, and some of them were in the form of guardian angels. These angels helped me in many ways. Most importantly they helped me when I was writing this book. I take this opportunity to thank them from the bottom of my heart. To Sada S Ghode, I owe a debt of gratitude for doing everything that was required to be done in this book, from searching for the descendants of Baba’s bhaktas to learning the intricate computer. Sandeep E Gondkar of Shirdi, an advocate by profession but a computer wizard, and god sent for me. Neeta Shebde of Pune, for sending me photographs of the devotees residing in Pune so I did not have to make the trips to Pune. Sri Krishna Kapur, New Delhi whose rinanubandhic ties with me made this book possible. He helped me in innumerable ways, they are far too many to mention. S K .Ghai of Sterling Publishers, New Delhi who treated me like a family member, and most importantly for publishing my book. I owe a debt of gratitude to Manjula S of Bangaluru, my spiritual guru. Thank you Manjula for interpreting all these difficult Sanskrit words, and parables for me.